Report – “Forza Ferrari!” the Italian accent might still need some work, but this was Sebastian Vettel’s happy radio message to the team on his slowing down lap, as he made it to the podium in his debut race for the Prancing Horse. It was the Scuderia’s first podium since Fernando Alonso finished second in last year’s Hungarian Grand Prix and it was Vettel’s first since a third place in Japan, also in 2014. The season started with a Safety Car, as Maldonado’s Lotus spun and crashed at Turn 2 on the opening lap, leaving plenty of debris to deal with. By then we had already lost Magnussen and Kvyat who had problems on the way to the grid and, of course the two Manor cars were not there either. 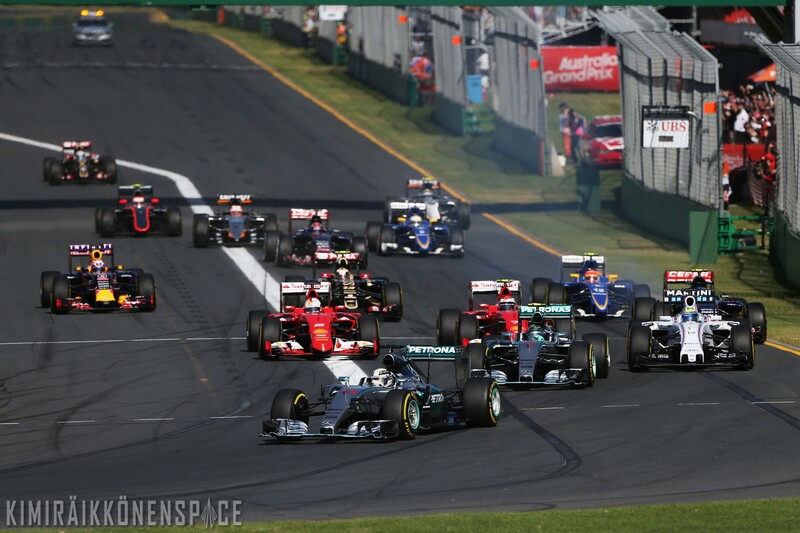 The Mercedes duo led off the front row, followed by Massa in the Williams. Kimi and Sebastian were behind the lead trio, but the Finn’s Ferrari found itself trapped behind Massa and dropped to eighth.Once the Safety Car came in, Vettel managed his race to the end and thanks to a well planned strategy, he was able to get ahead of Massa at his pit stop on lap 24. Kimi’s race was complicated by a problem with the left rear wheel, during his pit stop on lap 16. Trying to make up for lost time, he put in several fastest lap after fastest lap, passing Verstappen on lap 27, he was fifth and set off in pursuit of Massa. Unfortunately, there was a problem at his second pit stop, again with the left rear, which resulted in the Finn having to park his SF-15T at the side of the track. Sebastian Vettel’s third place is a great reward for all the hard work over the winter and a great incentive to learn lessons from the weekend and mount an even stronger challenge in a fortnight’s time in the heat of Malaysia. The early incident could have derailed Raikkonen’s race but Ferrari switched him to a two-stop strategy, which seemed to be working as he scythed through the field in his middle stint. He set several fastest laps before his second pit stop but then his hard work was undone when Ferrari failed to correctly fit his left rear tyre on lap 40. “I’m not very happy right now but I still believe in the race we are not too far away from Mercedes [on pace]. Obviously it depends on the race and what they do, we just had too many things not go our way today. I am sure we can be up there and fight at the front, so obviously we need to improve in qualifying as they are ahead of us by some margin. Things didn’t work out this weekend. Ferrari has escaped punishment from the Formula 1 stewards for releasing Kimi Raikkonen from his second Australian Grand Prix pitstop with the left-rear wheel not properly attached. Raikkonen stopped at Turn 4 on his out-lap after the problem – caused by damage from a cross-threaded nut at an earlier stop – was detected, costing him a likely fifth-place finish. But while unsafe releases usually lead to teams being punished, FIA technical delegate Jo Bauer accepted that the car was not sent out of the pits in an unsafe condition. One of the crew on the left-rear corner of the car did signal that there was a problem when Raikkonen’s car was released. But the stewards, including Le Mans legend Tom Kristensen, deemed that Ferrari had monitored this situation closely and stopped the car as soon as the data and Raikkonen confirmed there was a definite problem. “The team explained that the system used to monitor the pitstops gave no indication that the car was in an unsafe condition when released and the team caused the driver to stop immediately [once] the problem was apparent from the driver and telemetry. “The team had paid close attention to the telemetry after the actions of the team members involved in the pitstop and further that the FIA technical delegate accepted the car was not in an unsafe condition when released. Team principal Maurizio Arrivabene was seen talking with the pit crew after the incident, which he stressed was primarily to ensure the team remained focused. “I went down into the box first of all to calm them down because I didn’t want them to panic,” he said. “Second, I was asking the mechanics what had happened and if he could explain it to me. “I simply said to him ‘calm down, be focused, don’t worry'”. Sainz admitted responsibility for the incident. “I just know that I braked a tiny bit too” late, probably a bit too encouraged by the great start I got, and unfortunately I hit one of the Ferraris. I’m sorry for that. But lesson learned,” he said.